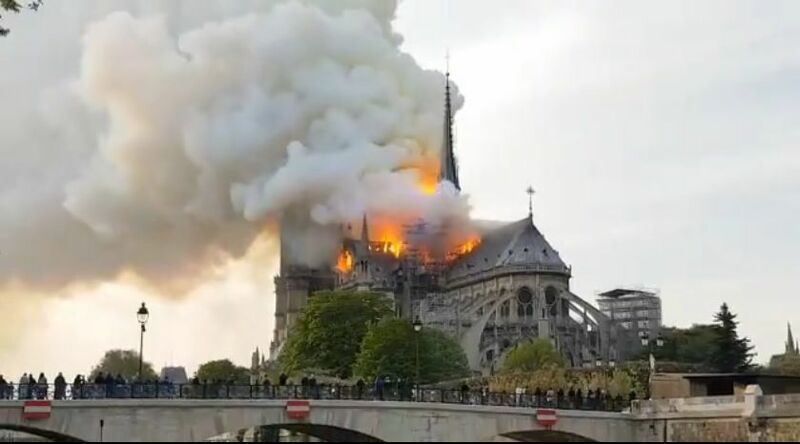 (PARIS) -- A massive fire engulfed the roof at the famed Notre Dame cathedral in Paris on Monday afternoon, collapsing the main spire in the blaze. The intense flames leaped out from two of its bell towers minutes before the spire collapsed. A church spokesman told French media that all of Notre Dame cathedral's frame is burning after the spire collapsed. Dramatic video showed black smoke billowing out from the top of the cathedral as firefighters furiously worked to contain the flames. Twitter users in Paris are posting videos that show the iconic spire in flames. The roof and spire collapsed in the intense fire. Firefighters were trying to contain the fire when the cathedral's spire collapsed. A cathedral spokesman has said the entire wooden interior of the Notre Dame is burning and likely to be destroyed. Paris Mayor Anne Hidalgo called it a "terrible fire." Hidalgo urged residents of the French capital to stay away from the security perimeter around the Gothic-style church. The mayor says city officials are in touch with Roman Catholic diocese in Paris. Notre Dame was undergoing a $6.8 million renovation, with some sections under scaffolding, while bronze statues were removed last week for work, Reuters reported. Authorities said the fire could be linked to the renovation work. It's unclear if anyone has been hurt in the fire. The cathedral, which dates back to the 12th century, was made famous for being featured in Victor Hugo’s novel “The Hunchback of Notre-Dame.” It attracts millions of tourists each year. French President Emmanuel Macron postponed a televised speech to the nation because of the massive fire. He tweeted that it was "sad to see this part of us burn." "Notre-Dame of Paris is in flames. Emotion in the whole nation. Thoughts for all Catholics and for all French," he tweeted. "Like all our countrymen, I'm sad to see this part of us burn." President Donald Trump tweeted about the fire, saying it was “horrible to watch the massive fire at Notre Dame Cathedral in Paris” and made suggestions for how first responders should tackle it. Copyright 2019 WDRB Media and Fox News. The Associated Press contributed to this report. All Rights Reserved.